Fiat Chrysler Automobiles NV could assign new vehicles to its Brampton, Ontario, assembly plant as early as 2020 if the Canadian and Ontario governments provide financial support for the project, the union representing workers there said Sunday. The new light vehicles would be built on an existing or new FCA platform, according to a proposed labour agreement between the company and the union Unifor. A summary of the tentative labour deal, reached late Monday, was distributed to members of the union before they voted Sunday whether to ratify the four-year pact. “The company commits to a next generation product or alternative product which could include an existing platform or entirely new vehicle architecture,” according to the summary of the contract obtained by Automotive News Canada. FCA builds the rear-wheel drive Chrysler 300 and Dodge Charger sedans, and the Dodge Challenger coupe, at the Brampton plant. The union said the ongoing success of the three models points to secure production for the duration of the new agreement but that "time is approaching" to make investments decisions on future products. “In the event a positive business case is confirmed, it is possible an alternative product, which could including an existing platform or entirely new vehicle architecture could occur during the term of this collective agreement,” the union said in the summary distributed Sunday. 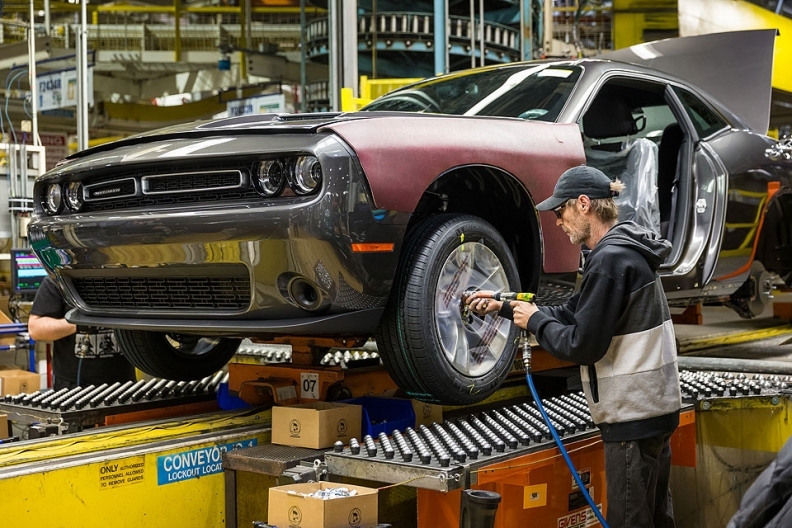 Under the tentative agreement, FCA plans a C$325 million investment to overhaul the Brampton plant's paint shop, which is aging and in need of repair, as well as pay raises and changes to pension plans for new workers. "There's been commitments from the government, at both the provincial and federal level, to now sit down and say, 'what do we do on a bigger scope to make sure we can secure good-paying jobs right here in Ontario? '," Dino Chiodo, head of Unifor's master bargaining committee for FCA, told Automotive News Canada on Sunday. "I think we will see that happen relatively quickly." The union's ratification vote on the FCA pact began at 9 a.m. EDT Sunday and will continue through the afternoon. Final results are expected later Sunday evening. If the contract is ratified, Unifor will begin negotiating with Ford Motor Co. on Monday, with a strike deadline set for Oct. 31. Should members reject the proposal, 9,750 FCA workers in Canada would be put in a strike position. A long-term strike could be costly for the automaker: The days supply level for four of the five vehicles FCA produces in Canada are below the company’s average of 73 days. Unifor President Jerry Dias framed the tentative agreement as a victory for Canadian autoworkers and for the long-term viability of the country’s manufacturing sector. "Securing new investments signals that the auto industry in Canada is here for the long term," Dias said in a letter handed out to FCA workers on Sunday. The paint shop at the Brampton plant will be shut down in the summer of 2017 to begin renovations. Dias said that investment commitment is not dependent on government support. Under the deal, FCA remains committed to building the Chrysler Pacifica plug-in hybrid at its Windsor, Ontario, plant. FCA showed the plug-in hybrid at the Detroit auto show in January, and it is scheduled to go into production next month at the Windsor factory. The FCA deal is patterned off the GM contract, so it also includes a $6,000 signing bonus for workers, two two-percent raises and three $2,000 lump sum payments over the life of the contract for veteran workers and pay increases each year for new hires placed on a 10-year grow-in wage grid. In exchange, new hires will be placed on a defined-contribution pension plan, seen as less costly and less risky for the employer. Like the GM plan, workers will contribute 4 percent of their earnings annually to the plan, which the automaker will match. Should workers ratify the agreement, Unifor will shift its focus to negotiating with Ford Motor Co. Dias said the union’s top priority will be securing investment at the automaker’s two Windsor, Ontario, engine plants, which build V-8 and V-10 engines for vehicles such as the F-150 and the Ford Mustang. Negotiations will also cover workers at Ford’s Oakville, Ontario, assembly plant, which builds four models, including the Ford Edge and Lincoln MKX, and which received a C$700 million investment.